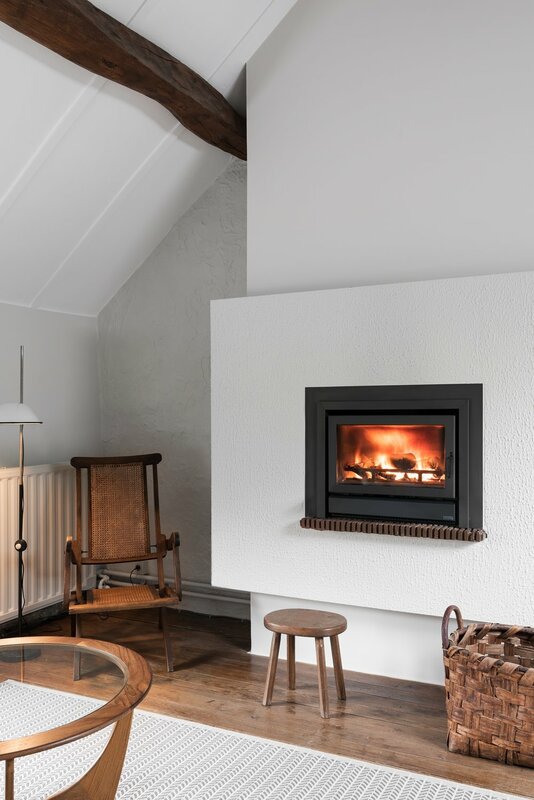 An update to the interior of a century-old farmhouse in the Belgian countryside brings harmony and a warmer, more welcoming interior to the home, which formerly lacked coherence and regard for its natural surroundings. The simple exterior volume of the farmhouse belies the interior, where every room across the two levels has a subtly different floor height. 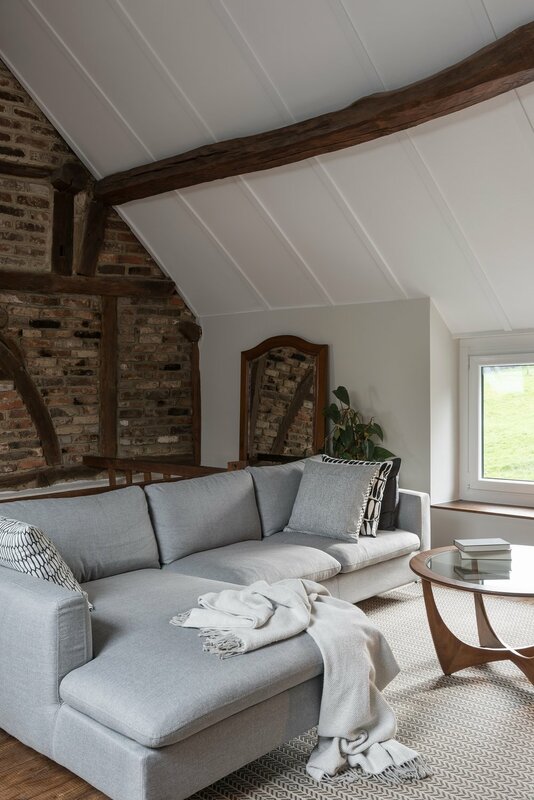 Natural beige tones for the walls and white ceilings were painted throughout to brighten and bring equilibrium to these disparate spaces, and to emphasize hewn timber beams and ancestral stonework. Wood flooring in the kitchen was preserved and stained to complement the original dark stone tiles in the entry and dining room, while durable natural fiber flooring contributes warmth to the living area. The former freestanding kitchen was completely renewed with a continuous countertop extending the length of the space, offering at one end a breakfast nook with a view of the creek that passes behind the house. Rising from the countertop, a large marble work surface artfully compensates for the former’s alignment to the window sill. A backsplash of locally-produced, sustainable tiles coordinates the marble with a natural mineral finish on the walls and a repurposed basin of hewn Belgian bluestone, originally a farm trough found on the property. New paint brightens the living room, liberating the space under the gabled roof. Light-shaded flooring in the bedroom reflects light from a low window, a wall painted charcoal to give dimension to the room. In both spaces, neutral white cabinetry makes efficient use of the roof’s incline as storage and surrenders attention to the furniture and decorative items from Belgium’s prolific flea markets, honoring the farm’s history and environs.